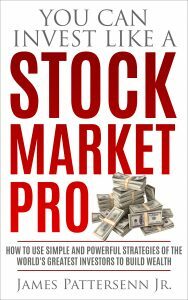 You Can Invest Like A Stock Market Pro is a how-to guide to help investors obtain market-beating returns from investing in stocks in the same manner that stock market pros do to amass their fortunes. The subtitle of the book is no hype: Both of the author’s investment portfolios have outperformed the stock market over the long-term through the use of the strategies detailed in the book. His original portfolio is more than 10 years old and his newest portfolio is more than six years old and both have total returns and annual rates of return that have outperformed the overall stock market since their inception. Because of the impact of the Great Recession that started in 2007, many Americans have become leery about investing in the stock market. That’s to be understood, since most owners of 401K’s and other investment accounts saw their accounts drop 30% to 50% in value during the period with the average 401K losing more than 40% of its value. This book is bargain priced from 04/13/2019 until 04/19/2019.